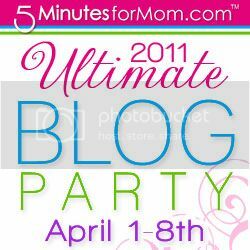 It's that time of the year again, it's the Ultimate Blog Party, hosted by 5 Minutes for Mom. I'm joining in the fun. Normally, I love to host a party, but being a guest will work just fine for me too! I'm a mom of two wonderful children. I love to see them learn new things, but feel a little sad that they are growing up so fast. My son is in the 2nd Grade and my daughter is 4 going on 24. I'm married to a wonderful man. We are about to celebrate our 12th anniversary. It's a little crazy to think that we have been married that long. I look back at our pictures and we were so young! We live in a comfortable, lived-in looking house and have a rather large cat, who is 13 years old. He started out as a cuddly little kitten, and then became a bit anti-social. Now, he likes to believe he is still anti-social, but frequently is found curled up on our bed in the morning. I work full-time at a job I really enjoy with a great group of people. It still is hard to leave my children everyday, but I know that they are happy in school and daycare, so that makes it not so hard. I love to cook and bake. I think I would enjoy going to culinary school. Imagine a career like that. In my MBA program, my business plan that I wrote was for a personal chef that would offer two services - delivery of meals for the week or come in one day a week to prepare a personal meal. You can check out my Menu Plans and my Recipes. I enjoy finding a good deal. Having this blog has allowed me to share my finds with others. Plus, I've learned a lot from reading other blogs. I never knew the deals at CVS were out there. I had been missing out for a long time. I love a good book. If I had a few hours to myself, I would be torn between taking a nap and reading a book. I like medical thrillers (Michael Palmer) and sappy love stories (Danielle Steel). I have read some interesting books for book clubs, but mostly, as a mom, I look for a quick read. If the storyline doesn't draw me in in the first couple of chapters, I'm not likely to finish it. You can check out the books that I have read recently here. I enjoy trying new things. I have tried many new things on my own, but also I have stumbled upon of new and interesting items through my blogging. Be sure to check out my current giveaways. Learn more about other bloggers attending the Ultimate Blog Party, by heading over to our gracious hosts - 5 Minutes for Mom. Leave me a comment with a link to your blog, so I can stop by and say hi! I'm totally the hostess type too, love to be the party place in our group of friends. It's great to meet you! Nice to meet you. I'm stopping by from UBP11. Come by my blog for some desserts and a giveaway. You're blog looks pretty interesting, I intend on coming back soon :) . I followed you on Twitter, hope you have an awesome weekend! Hi there, found your blog on UBP11! Can't wait to check it out. Hope to see you drop by my blog! I often find myself torn between a good book and napping also. I have two kids 5 & 2, so most of the time the nap wins! I found you through UBP11. Hi! Visiting via the UBP11. I have 2 kids also - a 3-1/2 yr old son and an 11-month old daughter. I'll be following along. Hi! Stopping by from #UBP11! Hope you're having fun partying! I sure am! My blog is www.momconfessionals.com and I'm on twitter @momconfessional You have a beautiful family! I really like to read too! New Follower from UBP11...Stop by and check out my blog if you have a minute.